When will the cost of a first class postage stamp reach $1.00? When will the cost be 74 cents? How soon should we expect the next increase? 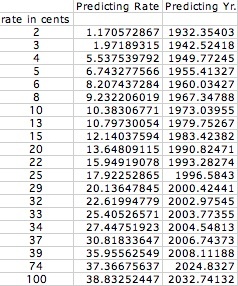 In 1996, the analysis of stamp data historically seemed to show that the postage double every 10 years approximately. The cost in 2006 would seem to argue the pattern is no longer valid. Is there evidence to show a change in the growth pattern? Or, was the double every ten years just a bad model? What do we know? 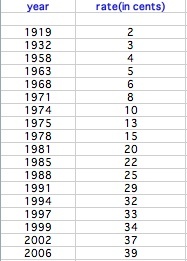 We were given the following data regarding the increase of stamps from 1919 to 2006. Let's analyze the given data for the stamps by creating a graph using Excel. It looks as though the price increase of the stamps takes the form of a exponential or power function. So, in order to make predictions and generate a function, we will use Microsoft Excel to add a trendline and a function. Here we decided to use a trendline that produced a power function noted above on right-hand side to the chart. This power function has allowed us to make predications about possible increases in the price of first class postage stamps. It is also possible to generate a exponential trendline and function. A power and a exponential function would produce the most accurate predications than any other function; however, the outcomes will be different. When will the cost be 74 cents? 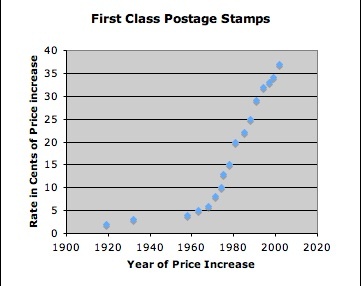 Based on the predicted data above, first class postage stamp will cost $0.74 during the year of 2024. When will the cost of a first class stamp reach $1.00? If the data is accurate, we will purchase stamps for $1.00 in 2032. Most think that the cost of stamps double every ten years. Is there evidence to show a change in the growth pattern? Was the 'double every ten years' just a bad model? 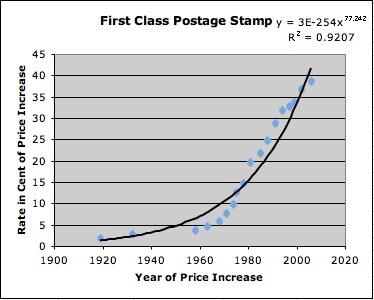 According to the data, there is no evidence supports the analysis of stamp prices doubling every ten years. One could say that the 'doubles every ten years' was a bad model since our predications fail to yield that result. Maybe the predication of 'double every ten years' was accurate in 1996, but given the current and sometimes unexpected circumstances of the economy one's analysis may become invalid.